Paschal Praises | Jeremiah Was A Bullfrog... Now He's Eastern Orthodox? with the Feast! Let us embrace one another. Let us say, Brethren! These words struck me like lightening. I realized I had not really payed very much attention to the words of the praises before. This verse is an exhortation that echoes the very words of Christ: “A new commandment I give to you, that ye love one another; as I have loved you, that ye also love one another. By this shall all men know that ye are my disciples, if ye have love one to another.” John 13:34, 35. I’ve known this verse for years, but have never connected it to Pascha. The connection was a very powerful one to me. As sometimes happens, especially during the Paschal Praises, I was a little choked up as this realization hit me. 1 hold (someone) closely in one’s arms, esp. as a sign of affection: Aunt Sophie embraced her warmly | [ no obj. ] : the two embraced, holding each other tightly. 2 accept or support (a belief, theory, or change) willingly and enthusiastically: besides traditional methods, artists are embracing new technology. 3 include or contain (something) as a constituent part: his career embraces a number of activities—composing, playing, and acting. 1 an act of holding someone closely in one’s arms: they were locked in an embrace.• used to refer to something that is regarded as surrounding, holding, or restricting someone: the transformations brought about by the embrace of mass media. 2 [ in sing. ] an act of accepting or supporting something willingly or enthusiastically: their eager embrace of foreign influences. As it turns out, my daughter’s definition was pretty close. In reading the definition of the English word Embrace, it made me think of the fact that our salvation id dependent on one another. My brother IS my salvation. I hold them, accept and support them, I include and count them as a constituent part. It is so much bigger than just having kind affections for one another. It encompasses all that the New Testament says about what it means to love one another: forbearing, bearing one another’s burdens, exhorting each other, etc, etc. On the issue of forgiving our enemies (or “those who hate us”) I used to always pay that lip service. 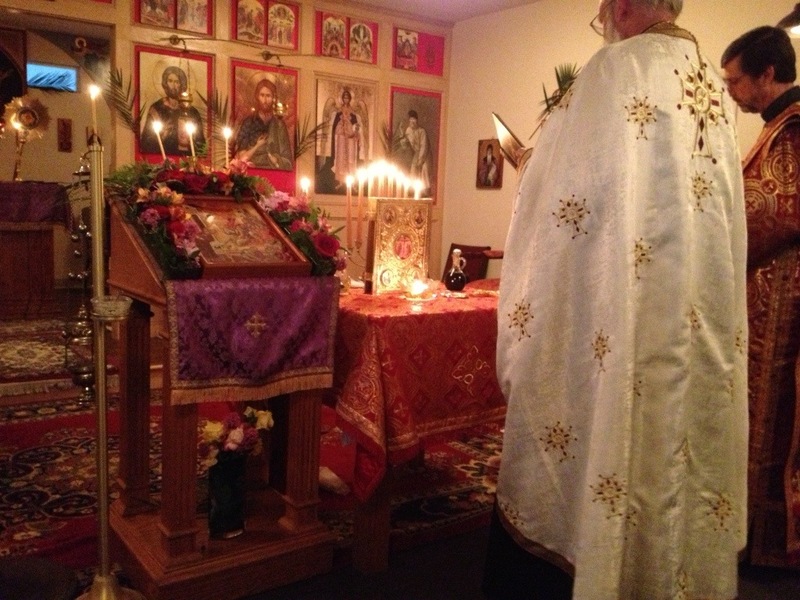 I have noticed in Orthodox theology, the words of Christ in teaching us the Our Father are taken very seriously, along with the instruction, “…for if you do not forgive, neither will your Father in Heaven forgive you.” I think of how at the end of the Liturgy, the priest prays the words, “…Thou blessest those who bless Thee, and sanctifiest those who put there hope in Thee…” I find that to be a stunning difference for the near joy that I used to take in the words of God to Abraham, “I will bless those who bless thee, and I will curse those who curse thee…” No vengeance in the mind and heart of God. Neither should we have any such thing in our hearts. All this is the very basis, the real manner in which we exclaim that “Christ Is Risen.” I hope for myself that this realization doesn’t just become another “nice thing that I learned from the Church”, but a life changing course of action. I am blessed to go to a parish that called together a parish meeting, just so we could find ways to be more than just a group of people that are Orthodox and worship and pray together. I pray that I can live up to these words. By God’s grace and mercy, in His Church, I can live up to His commandments; and His commandments are not grievous. The lesson I found in the praises of Matins is a great example of what I love about the Orthodox Church. The very services themselves are a catechism in the faith. The thing is, I have to be listening. I was discussing the issue of repetition within the services with someone recently. The contention of the person I was talking with was, the services are very repetitive, boring and therefore, frustrating. But as the words of the Praises show, each service, each part of the service, has something to teach a Christian that comes to “worship Him in spirit and in truth” (as we read in the Gospel for the Sunday of the Samaritan Woman). I think that hand-in-hand with the reading of the Holy Scriptures, we Orthodox Christians could glean so much for our salvation by simply paying attention to the things we sing and pray. Or if we aren’t singing, at least listening attentively to the choir and/or priest. Lastly, I like that the end of the exhortation in the Praises say, “…and in this wise let us exclaim…” Our life in Christ is meant to be a bold proclamation to the world about out Resurrected Lord. It’s not a whimper, a humble word whispered in secret, it is exclaimed. This is more than “telling someone about Christ” (i.e. “Where are you going to go when you die?”) or being obnoxious with “the Gospel.” As I have stated elsewhere, one of the things I love about Orthodoxy is that it has a “come and see” ethos, rather than the kind of anxiety-ridden mentality that tells everyone they need to decide “RIGHT NOW!” or else they might find themselves in hell at any second. Not that we aren’t concerned for souls, but it’s an invitation to experience, not a high-pressured sales pitch. But either way, our love and forgiveness shout out the glory of Christ’s trampling down Death by His death, and His life that He gives to all, by His Resurrection.